That photo is from a few days ago. We’ve actually finished wallpapering now, but I still need to recover the chairs. We also need new outlet covers and switchplates, and I’d like to change the fabric in the built-in hutch. Ideally, I would like the ceiling and the area above the picture rail to be painted, but that probably won’t happen right now. I’d also like a new rug, but that’s something else that can wait. Previous Post We're Having a Girl! 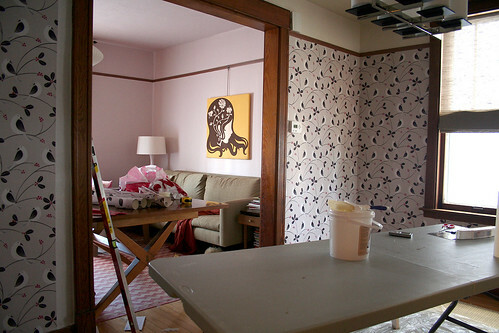 Beautiful job – I’ve wallpapered 4 walls in our house and never was so bold as to do it myself so big props. Many congratulations on your baby daughter and if I can add… go with the natural Eames rocker. I have one in that color and have it in rooms with varying color schemes and it always looks right. Plus, I think we’re similar in that I always have to have a project so it’s good when pieces can be moved around. the wallpaper looks so great! It’s picture rail. You can buy hooks and hang your art off of them (without putting holes all over your walls)! Hi! I just started reading two days ago and had to put a lot of things on hold since I got sucked in! Your home is beautiful! It reminds me of what I did with our last apartment… only much better. Plus my husband hates pink! (Why didn’t we discuss that before we got married?!) Anyway, wonderful job, the wallpaper is to die for, and congratulations on having a girl! Looks fantastic… congrats on finishing! AND congrats on the little girl news!! Looks great! (and how I envy your picture rail, living with plaster walls can be trying!) What colour do you want to paint the wall and ceiling above the picture rail? Great choice of wallpaper! There is a nice flow from room to room. I love the wall paper! Such a great print! Totally suits that modern retro look! It’s going to be gorgeous! I love that wallpaper! I am not a fan of wallpaper, but I just LOVE yours. Maybe it’s time I revisit the world of wallpaper…..GREAT JOB!! Oh, and congrats on Baby Girl!!! I love the wallpaper, can’t wait to see it finished! Fantastic blog! I love the closet post (found by Decor8). Best of luck with that baby girl. I think this is soooo lovely. It looks similar to how I hope I can restore our old home’s trim. You Are SO LUCKY that it’s not all gunked up with a ton of layers of old lead-based paint. And, I think it’s great that you decided to keep the natural wood, and chose such a wonderful pattern that compliments it!